Our latest CPD in-house learning evening was held at the end of November. The evening was superbly hosted by our Pilates instructor Vicci Gillett. Vicci gave us an excellent insight into her ‘One Pilates’ sessions, aimed at identifying asymmetry and weakness in movement and hence rehabilitation from injury or chronic musculoskeletal problems. 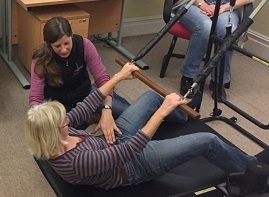 She identified plenty of problems with the practitioners in attendance, through a hands-on demonstration of working with the Pilates equipment called Reformers. It was an interesting, fun and informative session and a fantastic way for us all to learn more about Vicci’s role and how Pilates may help us achieve better long term outcomes for our patients. More information on Vicci’s Pilates sessions can be found on the Pilates page.